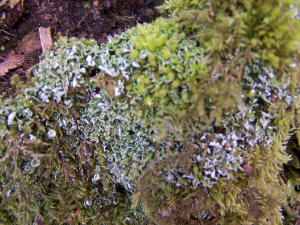 Observation - Lichen growing amongst moss - UK and Ireland. Description: Tiny green lobes (squamules), turning upward round the edge showing paler underneath. Tiny green lobes (squamules), turning upward round the edge showing paler underneath.